I grew up ice skating outdoors on a frozen pond each winter. Indoor skating was unheard of - unless you were training for the Olympics or something. There's just something about an outdoor skating experience that seems right, it seems closer to that image of the Peanuts gang skating that we all know and love. Frozen ponds have all but disappeared, probably due to insurance companies. Outdoor rinks are getting rarer. My town, Madison, does have an outdoor rink, but we have to relay on Mother Nature to prepare it, and she doesn't own a Zamboni to smooth out the ice or limit hockey games, so calm skating is somewhat unattainable. But never fear! 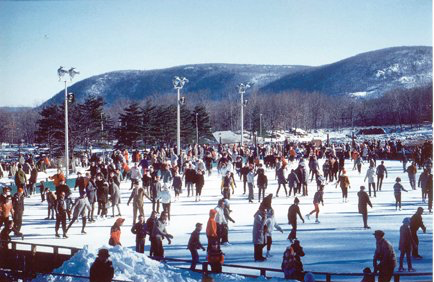 Did you know that there's an outdoor rink with gorgeous scenery, crisp mountain air and all the benefits of an indoor rink (skate rentals, Zamboni, snack bar, etc), up at Bear Mountain in New York? It's an easy 1 hour drive - and once you're done skating there's also a vintage merry-go-round and the famous Bear Mountain Lodge to warm up in. Basically something for everyone. They have scheduled skate times that last an hour and a half each, so be sure to check the schedule for times before heading off. Prices are reasonable (less then $10 for admission and skate rental), but they do charge for parking on weekends and holidays. Here's how I would plan the perfect day: Have a quick breakfast at home, pack the kids in the car and arrive at Bear Mountain in time for the 10:00am skating session. Bound to be less crowded then later on in the day. And I'm all about less crowds. In fact, my youngest son says that wherever we go, crowds follow, but that's just because we get there early. After skating, head down the hill for a ride on the carousel. Take you time getting there because everyone else is going to be doing the same thing, so there's no rush. Let them get there and done first. Or - if you have energy, walk over to the lodge first, and then return later for the carousel. Drive or walk (7 minute walk) over to the lodge and grab a lunch at The Hiker's Cafe - very kid friendly. Load everyone back in the car with hopefully some snoozing for the kids on the way home. Arrive back home in the late afternoon exhausted but happy. Make it even easier by putting dinner in the crock pot before you go, and you're done for the day. Have a great time! Ta ta for now..... Mrs. C.
Evelyn Cucchiara - mom of 3, seeker of fun, and a whiz at organization and time management - strictly so I can get back to the FUN! Thanks for joining me. Find more on The Toy Tamer.